I have just published the second timeline of September, so it’s finally time to publish the statistics derived from the two Cyber Attacks Timelines of the same month (Part I and Part II). As usual let’s start with the Daily Trend of Attacks, whose shape, this month, really looks like a rollercoaster, with multiple peaks and an average level of activity that tend to decrease at the end of the month. 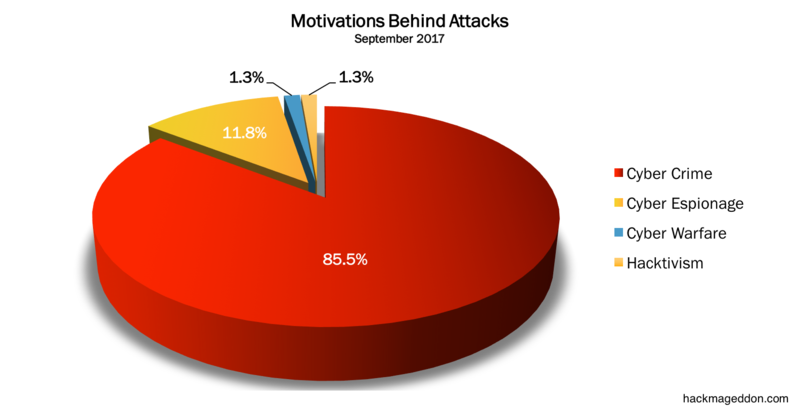 Cyber Crime leads the Motivations chart with 85,5% (was 77.8% in August), back to the levels of July. Cyber Espionage grows to 11.8% from 10%. Cyber Warfare and Hacktivism drop to 1.3% from respectively 6.7% and 5.6% recorded in August. The Attack Vectors chart sees the Malware on top, as usual with 31.6% (it was 34.4% in August). Targeted attacks rank at number two among the known attack vectors with 14.5% (vs 16.7% of August). Account Hijackings plunge at number three with 9.2% (vs 22.5% of August). For the third time in a row, the Distribution of Targets chart is led by Single Individuals with 28.9%, down from 33.3% of August. Industry confirms the decreasing trend sliding to 13.2 from 18.9% August. Governments are essentially stable at 10.5% from 10% of August. The first three places are indeed exactly the same of August. The Industry Drill Down Chart is not particularly meaning, it is led by Entertainment and the rest is behind. …. Similarly to the Organization Drill Down chart led by Political Parties. As always, bear in mind that the sample refers exclusively to the attacks included in my timelines, aiming to provide an high level overview of the “cyber landscape”. If you want to have an idea of how fragile our data are inside the cyberspace, have a look at the timelines of the main Cyber Attacks in 2011, 2012, 2013, 2014, 2015 and 2016 (regularly updated). You may also want to have a look at the Cyber Attack Statistics. Of course follow @paulsparrows on Twitter for the latest updates, and feel free to submit remarkable incidents that in your opinion deserve to be included in the timelines (and charts).